Lighthouses and fried clams are as popular as ever on Cape Cod this summer, but they’re sharing top billing with a surprise attraction: sharks. While skittish swimmers may be less inclined to go for a dip in the ocean following an apparent great white shark attack in Truro this week, officials and business owners say the publicity is boosting revenue. “Anything that brings people to town is good for tourism, and the sharks are bringing people to town,” said Lisa Franz, executive director of the Chatham Chamber of Commerce, where there have been an increasing number of shark sightings over the past few summers. From the kayaker who was trailed by a shark off Nauset Beach in Orleans in July to this week’s attack on Ballston Beach, the Cape has attracted national attention because of all the offshore activity. To up the drama, almost every report references “Jaws,” the 1975 Steven Spielberg classic filmed largely on Martha’s Vineyard. With the summer vacation season peaking during the first three weeks in August, the timing couldn’t be better for the local economy. “It’s always good seeing your name get out there,” said Bill Catania, owner of the Cape Codder Resort and Spa in Hyannis, where a “shark-free” package this month includes a two-night stay with meals, along with passes to the hotel’s wave pool and water slide. Tourism officials say that despite Monday’s incident — the Colorado man who was bitten is on the mend — most visitors are not afraid to step on Cape beaches this summer. “If anything, people have been curious,” said Wendy Northcross, chief executive officer of the Cape Cod Chamber of Commerce Convention and Visitors Bureau. Other unusual animal sightings, like the bear that swam across the Cape Cod Canal on Memorial Day weekend and popped up in West Barnstable, have also spurred day trips this year, Northcross said. Overnight stays on the Cape were up 10 percent this June compared with last year, which Northcross chalks up to consumer confidence and an improved economy, not dorsal fins. July numbers are not out yet. With the seal population rebounding in New England, and more of them making the warm waters off Chatham’s Monomoy Island home, sharks have swooped in to feed. “They prefer seals — it’s like an ice cream sundae, that’s what they like,” said Nancy Underhill, owner of the Chatham Bag Boutique. Underhill’s shark collection, launched this week, features mugs and hats that read: “Chatham, for those with discriminating taste,” beneath a graphic of a great white. Her shark swag, soon to include beach towels and magnets, has been in demand with tourists from Kentucky and Ohio, Underhill said. “It’s not just tourists, we ship them all over the country. I saw people up the Cape wearing them last night,” said shop owner Sandra Wycoff, whose daughter dreamed up the concept a few years back. 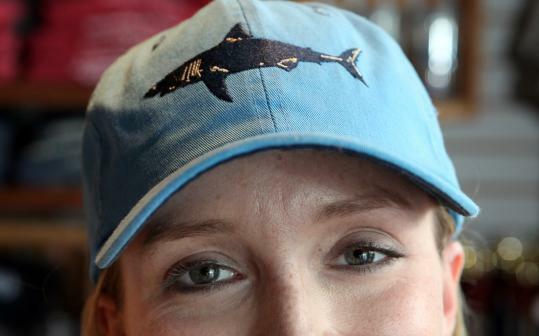 Wycoff said sales of shark-themed shirts have increased 10 to 20 percent annually in recent years at her two stores — the other is Chatham T. Co. for Kids — and online, eclipsing those with whale motifs. There’s little chance that the shark frenzy will fizzle soon — the Discovery Channel’s “Shark Week,” which includes footage of Chatham’s newest visitors, is scheduled to start Aug. 12. For retailers like Wycoff, who will show the program in her store, all the attention is akin to a mini-stimulus package. “It’s a lovely little formula. It’s like the stars are lining up,” she said. Even as caution signs went up along Cape Cod National Seashore beaches this week, sunbathers swarmed the sand. Chief ranger Leslie Reynolds said parking lots were at capacity at Race Point Beach in Provincetown Wednesday. “It’s a normal day at the beach, for whatever that means now,” she said. At Chatham Water Tours, many of the people boarding seal-watching vessels are really hoping to glimpse a shark, said owner Dave Murdoch.